Rare plan detailing Christopher Wren's proposed reconstruction following the 1666 Great Fire of London. An extremely scarce 1744 map of London showing Sir Christopher Wren's plan for reconstructing the city following the 1666 Great Fire of London. In 1666 the Great Fire swept through the old Roman portions of London, laying waste to most of the original walled city. Christopher Wren, a well known architect of the period was quick to respond to the disaster as a opportunity to dramatically redesign and modernize London's center. Wren having been schooled in Paris envisioned an elaborate classically influenced reconstruction of the city with broad avenues meeting in a series of Piazzas. 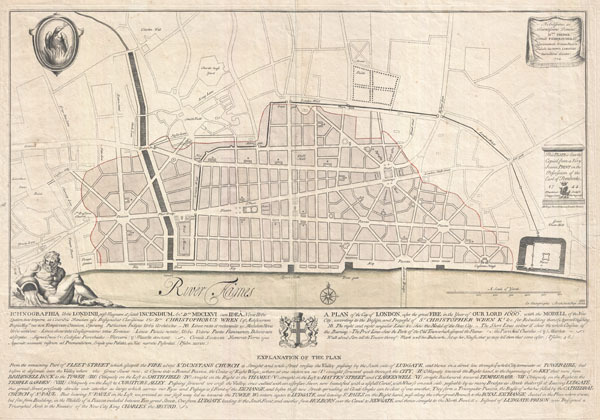 Despite, or perhaps because of, Wren's promptitude in producing a plan for a major post-fire reconstruction, his plan exhibits a number of dramatic errors. Wren did not take the city's topography into account and consequently much of the this plan is unfeasible. Despite claims to the contrary in the document itself, Wren's plan was never seriously considered by either the King or the Parliament. This plan is highly uncommon and rarely appears outside of institutional collections. Christopher Wren (October 20, 1632-February 25, 1723) was an English architect and geometer active in the later 16th and early 17th century. Wren is considered to be one of the most prolific and highly acclaimed English architects in history. In the late 17th century architecture such as we know it today did not exist, rather it was considered a branch of mathematics and as such was consequently an acceptable hobby for the gentleman of distinction. Wren acquired an interested in architecture as a young man and developed his interest through varied studies at Oxford. Wren career as a architect received a significant boost from the Great London Fire of 1666, which facilitated an almost complete reconstruction of much of the city. Wren is responsible for some 55 churches as well as numerous other significant works. In recognition of his accomplishments Wren was knighted on November 14, 1673. He was also a founding father of the Royal Society. Though sickly as a child, Wren lived to a ripe old age 90. Wren is said to have passed away after taking ill on a trip to London in order admire his greatest masterpiece, St. Pauls Cathedral. Paul Fourdrinier (December 20, 1698-February, 1758) was an engraver and print seller active in London, England during the first half of the 18th century. Paul Fourdrinier, who is also known to have published under the names Peter Fourdrinier and Pierre Fourdrinier, was of French Huguenot extraction from Dieppe, Normandy. His family fled to Groningen, the Netherlands, in the late 17th century. It was here that Paul was born and raised. As a young man he studied engraving with the well known Amsterdam engraver Bernard Picart. Around 1720 Fourdrinier and his wife, Jeanne Theroude, relocated to London. Fourdrinier's aptitude as an engraver quickly attracted a following in London where he is known to have produced a number of important portraits and views, most of where are simply signed "P. Fourdrinier". Fourdrinier was a member of the parish of St. Martin's-in-the-Fields. He died in January of February of 1758, leaving a son, Henry Fourndrinier, to follow in his footsteps. Very good. Orignal centerfold. Light toning. Yale University, British Arts, Folio A G 11. British Library, Maps CC.5.a.197. Folger Library, MAP L85c no. 25.